A 1913 photo featuring a number of prominent Western Australian lawyers recently found in the Old Court House Law Museum collection inspired the Armistice exhibition to commemorate the 100 year anniversary of the end of World War One. Some of the individuals in the photo were unable to contribute to the war effort, some returned after active service and some never returned. Max Kott (pictured far right in the second row) returned to establish what is now, Kott Gunning Lawyers. 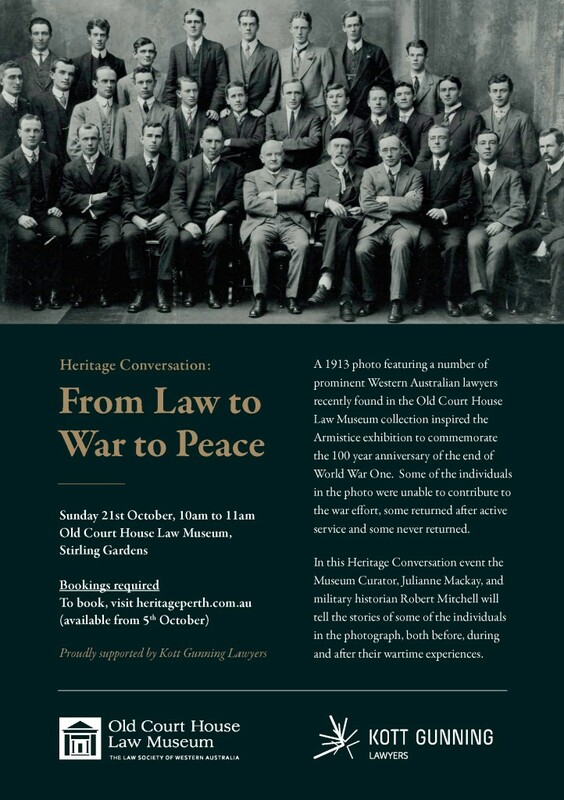 Kott Gunning is proud to support the From Law to War to Peace Heritage Conversation by the Museum Curator Julianne Mackay and military historian Robert Mitchell to tell the stories of some of the individuals in the photograph, both before, during and after their wartime experiences. More details about the event can be found below, on the Law Society of WA’s website and Old Court House Museum’s Facebook page.